My rabbit had one kit....Should I be worried? My Lionhead doe had only one kit today, should I be worried? I have never bred rabbits before, but I have had them for 4 years. Your article helped a lot! 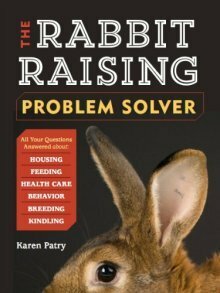 my 4-H rabbit book pretty much said if your rabbit isn't nursing kill it. I got so worried because I thought the baby would die because my doe wasn't in the box. I breed sheep and they are always with their young. Your article lets me breathe a little......Thank You!!!!!!!!! Comments for My rabbit had one kit....Should I be worried? Not sure what's up with that 4-H book...! Oh well, if you've looked through this website, you now know that litters can include from 1 to 15+ bunnies, and the doe spends very little time in the nest. If you check the baby kit in the morning and it has a big round tummy, you'll know the doe is doing her job. We're thinking probably no worries - your doe's instincts will drive her to look after the kit. RE My rabbit had one kit....Should I be worried? No, do not worry. It happens. Small breeds like Lionheads tend to have small litters. So it is normal. Just as long as the doe is nursing it the baby will be fine. If the doe is not, you can start bottle feeding the kit.